LIQUIDCAPSULE Manufacturing LLC is the only approved contract manufacturer for INNERCAP Technologies, Inc.'s patented delivery system for INNERCAP's Licensees of the patented multi-phase multi-compartment combination capsule products. LIQUIDCAPSULE Manufacturing has the capabilities fill two-piece gelatin and HPMC capsules with liquids, semi-solids, beads, powders and suspensions. LIQUIDCAPSULE also provides packaging, labeling and bottling services for products. Sachets with liquids and gels. LIQUIDCAPSULE uses capsule banding machines to seal capsules and make the capsules tamper evident. Capsule banding is the only approved method for sealing over the counter pharmaceutical (OTC) pharmaceutical capsules and making a tamper evident seal for the two piece hard shell capsules. Capsule banding is the method for sealing the majority if not all of Rx Pharmaceutical products on the market today. 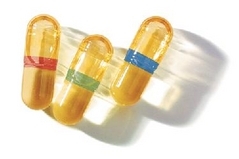 The capsule banding method provides an elegant visually appealing tamper evident seal vs other methods that create an uneven and disfigured seal on capsules.